Compare two poems from the pre-1914 selection which use strong description and imagery. You should look closely at the language used. 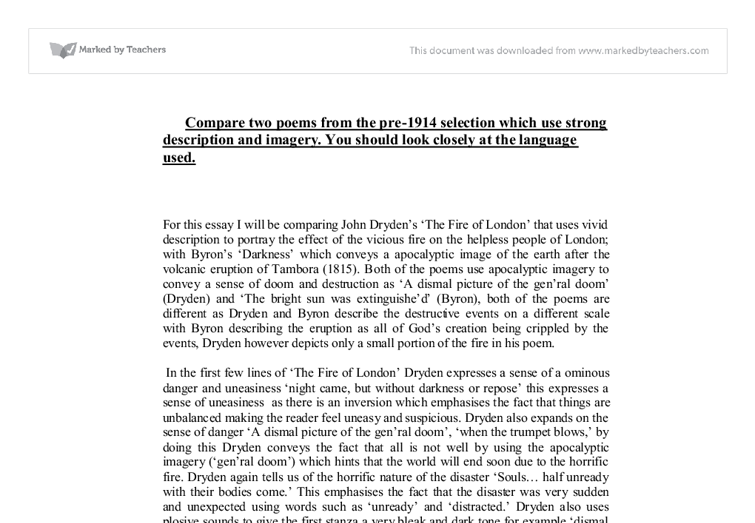 For this essay I will be comparing John Dryden's 'The Fire of London' that uses vivid description to portray the effect of the vicious fire on the helpless people of London; with Byron's 'Darkness' which conveys a apocalyptic image of the earth after the volcanic eruption of Tambora (1815). Both of the poems use apocalyptic imagery to convey a sense of doom and destruction as 'A dismal picture of the gen'ral doom' (Dryden) and 'The bright sun was extinguishe'd' (Byron), both of the poems are different as Dryden and Byron describe the destructive events on a different scale with Byron describing the eruption as all of God's creation being crippled by the events, Dryden however depicts only a small portion of the fire in his poem. 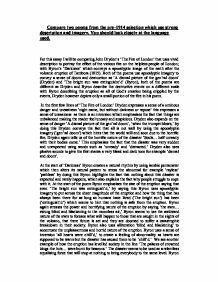 In the first few lines of 'The Fire of London' Dryden expresses a sense of a ominous danger and uneasiness 'night came, but without darkness or repose' this expresses a sense of uneasiness as there is an inversion which emphasises the fact that things are unbalanced making the reader feel uneasy and suspicious. Dryden also expands on the sense of danger 'A dismal picture of the gen'ral doom', 'when the trumpet blows,' by doing this Dryden conveys the fact that all is not well by using the apocalyptic imagery ('gen'ral doom') which hints that the world will end soon due to the horrific fire. Dryden again tells us of the horrific nature of the disaster 'Souls... half unready with their bodies come.' This emphasises the fact that the disaster was very sudden and unexpected using words such as 'unready' and 'distracted.' Dryden also uses plosive sounds to give the first stanza a very bleak and dark tone for example 'dismal and doom'. At the start of 'Darkness' Byron creates a natural rhythm by using iambic pentameter which then alters its natural pattern to stress the abnormal ...read more. We first see signs of how humans are dealing with it when Byron says 'sate sullenly' by saying this Byron implies that there is a breakdown of community and that the human race has been reduced to selfish individualism in a hope to survive. This shows how much the eruption has changed humans as they are normally kind, caring and selfless people but they have had to change in order to survive. We see another example of this 'gorging himself in gloom: no love was left', by saying 'gorging' Byron implies that the people are eating like ravenous beasts, whose first instinct is to survive and they will sacrifice anybody in order to achieve this, Byron says this' no love was left' again this is just one of the many times that Byron by using strong description hints that human nature has been changed as a result of this tragedy. As seen earlier in the poem Byron again implies that humans want a quick and painless death and although they may hope that they will survive they believe that they will not, 'all earth was but one thought and that was death immediate and inglorious', by describing the thought of not one but 'all earth' Byron is describing the thought of everyone thus showing the impact that the volcano has caused as people actually wish to die making the poem more tragic and horrifying. We the best example of Byron making the poem more horrifying and shocking, 'the meagre by the meagre were devour'd', Byron says that humans have resorted to cannibalism in order to survive. It is like humans have reversed to their primal instinct thus showing how desperate and deprived they are. It is almost like humans are lost and have forgotten who they are and what they meant to be as a result of the volcano. Byron by describing it in this way saying 'meagre' implies that they literally have no choice but to do it in order to survive. ...read more. In the last sentence of 'Darkness', we see Byron describing the situation of the world by using nature and associating it with death. He also uses personification to highlight this as well, 'The waves were dead; the tides were in their grave, The moon, their mistress, had expired before'. This shows the strength of the disaster as it has not only destroyed living things and objects but has also thrown the whole universe into chaos as the forces of nature are being destroyed and they are in the end more powerful that any living thing or object. Therefore showing how much power the volcano must have possessed as now everything in its path is feeble and incredibly vulnerable. The final thought of the poem is a personification of all consuming darkness that has swept the world and is Byron's way of summing up his poem, Darkness had no need of aid from them -she was the universe. After looking and comparing both poems description and imagery, I have concluded that although both poems describe and illustrate disaster's that hurt and cause suffering to both humans and those alike, Byron however seems to focus more on the sheer scale and size of the eruption describing more of the destruction caused rather than the emotional side of things, 'The bright sun was extinguish'd'. Whereas Dryden depicts more of the emotional and the human frame of mind during the fire rather than the sheer destruction, 'instead of milk a falling tear'. A common theme throughout both poems is the use of metaphor to put across the feeling of the people or the scale of the disaster. Therfore the two poems 'Darkness' and 'Fire of London', are similar in that they both describe a life changing but also horrifying event but differ in the way that the writers have chosen to describe there event as one depicts the human impact whilst one depicts the destruction and scale of the particular disaster. ...read more. Compare the presentation of relationships in &amp;quot;My Last Duchess&amp;quot;, &amp;quot;Porphyria's Lover&amp;quot; and &amp;quot;The Laboratory&amp;quot;. And yet God has not said a word!" The speaker is suggesting that the murder was right because God had not said a word, God has not punished him. However, this line is ambiguous, as it could indicate that God might still do. Sixty lines could represent the sixty minutes of an hour, thus suggesting that the murder took place in an hour. a much more forceful and aggressive tone as the poet uses his partners own beliefs and words against her. So To His Coy Mistress is much more persuasive in my opinion because it sounds nicer. There are many ways how a modern and contemporary audience would respond to the poems. people, which can relate to the modern day as now the idea of religion isn't publicised in a positive way. Both Poems were written during the same era, the industrial revolution. The industrial state that the city was in disfigured how it was run. Lovelace is a Royalist; he followed the King and believed that he King should have definite power and rule over his kingdom. Lovelace lived in the era of the English Civil War; Lovelace will no doubt have been a follower of King Charles II and as a result was imprisoned by the Parliamentarians. Similarly Will. H. Ogilvie complements Ben Hall and the image of Australian bushrangers as outlaws that were elegant in what they did. Ogilvie describes Ben Hall as an outlaw that 'stole like a hunted fox'. 'And peered like a hawk from his eyrie rocks..